I found out about this IDC (instructor development course) from an ad on the web. In addition to selling the IDC, the web page also talked about incredible diving on isolated islands, white sand beaches, turquoise waters, thriving reefs, etc... Unfortunately the IDC and the dive resorts have nothing in common. The IDC is being held in Nadi (pronounced "Nandi") town, which is basically a dump. I spent the day wandering around town and trying to figure out how I am going to explain to Tuk that when she arrives here in a few days she'll be on her own for two weeks while I study madly. Visit the dive shop to meet the course director and pick up some materials to begin studying for the IDC. Really, I might just as well have been in Cleveland. I spent two weeks in Fiji and saw nothing by the classroom and my hotel. People say it's nice here, even after the coup, but I have no idea. Oops, wait a minute, do they have coups in Cleveland? I guess there are a few other differences, Bula! seems to mean hello, goodbye, cheers!, and even god bless you. Maybe the people just like to saying it? Bula! Do they do that in Cleveland? Also, kava is quite popular here. Kava is a (legal) mild hallucinogenic drunk out of a coconut shell with a traditional rite. I'm pretty sure they don't do much of that in Cleveland, but apart from those few differences, I'm sure they are just like each other, at least the parts I saw. The IDC is a 10 day intensive program designed to bring candidates up to speed on teaching the PADI system of diver education. A few days of lectures are followed by critiqued teaching presentations in the classroom, pool, and open water. The IDC itself might actually be fun if the IE (instructor exam) didn't loom. Following the IDC is the 2 1/2 day IE. A battery of academic test are given, none of which are covered in the IDC. Physics, physiology, equipment, tables, and a diving skills exam all have to be self studied for. There is also a PADI standards and practices exam as well as a water skills test and 800 meter swim. The heart of the IE though are the three evaluated teaching presentations. One in the classroom, one in the pool and one in open water. Fellow candidates act as students and are assigned "problems" to have so the candidate acting as the instructor can be evaluated on his or her responses to the problems. One makeup is allowed in the classroom and the pool, but a mistake in the open water presentation results in non-certification. You have to worry not only about yourself, and passing your presentations, but just as well, you don't want to have an unintentional problem and complicate someone else's presentation. Fly to Tarawa, the capital atoll of Kiribati (pronounced "Kiribas"). No, I don't know why it's pronounced that way, but I'll be sure to ask them. 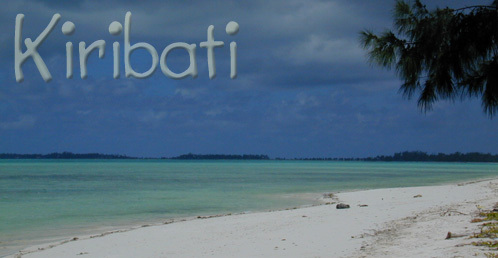 Kiribati (pronounced "Kiribas") is a tiny, but vast country. Its 33 islands amount to just 811 sq km (315 sq mi), but are spread out over 3.5 million sq km (a lot) of ocean. Tarawa atoll is the capital and home to 33,000 people. Flying in, it became apparent just what the words "lagoon" and "atoll" really mean. 1. The volcano forms a new island. 2. The now dormant and eroding volcano is surrounded by a fringing reef. 3. The volcano has completely receded, and only the coral reef (atoll) remains. From the air we could see that Tarawa is a typical atoll, a thin, ring-shaped group of islets with a central lagoon. At it's widest point the land of Tarawa is only a few hundred yards/meters across, and from one side of the lagoon to the other is around 40 km (25 mi). Like most land in the South Pacific, atolls begin life when an underwater volcano breaks the surface to form an island. As the volcano quiets, a coral reef begins to grow on it's shore. Corals are actually tiny animals that feed on other small creatures. The reefs that divers are so familiar with are formed from the exterior skeletons of coral colonies built up over many years. Corals need light and warmth to survive, so as the volcano slowly erodes back into the sea, the coral reefs grow upwards, endeavoring to stay near the surface. As the volcano recedes a lagoon forms between it and the barrier reef, and when the volcano finally disappears completely only the reef, now called an atoll, and it's interior lagoon are left. Atolls are at first barren, inhospitable places, but waves break down the coral a bit and soon the seeds of hardy plants like coconuts can take root. As the waves and plant roots continue their work, more and more life is possible. Seeds are carried by birds or washed ashore by the sea. Many years of nature's patient work result in the sandy bits of paradise that we today find dotting the South Pacific. To be honest, I'd never heard of Tarawa/Kiribati before it showed up as a two-day layover on our way from Fiji to Majuro. Lonely Planet South Pacific devotes three thoroughly uninspiring pages to the island, so it was with some trepidation yesterday that we stepped off the plane and into the blazing heat. Americans and Thais are both supposed to obtain a visa before traveling to Tarawa, but we didn't quite manage to work that out in Fiji. As they'd promised though (through email! ), the immigration folks met us at the airport to issue on-arrival visas (for AUS$40 each). Score one point for Tarawa, I'm not sure how many favors I'd be able to arrange through email with US immigration. The airport was a ramshackle affair, but I've seen worse. On the upside, there was lots of ice cream for sale to cut the scorching heat, but on the downside there were no phone cards available to make calls on the one, card-only, phone. Lack of a telephone seemed like it was going to make it nigh impossible to find accommodation, but I finally managed to talk the customs officer into letting me use their phone. Welcome to the South Pacific. It turns out that the new parliament building is opening this weekend, and it's an exciting time on Tarawa. Most of the hotels on the atoll are fully booked, except of course, for the most expensive. Few parts of the islands are wider than two or three hundred meters/yards, and there is only road that splits them down the middle. Everyone has waterfront property, but few of the people here can afford to do more than just throw up a straw hut or lean-to. Kiribati was fairly well-off as a British colony, supported by phosphate mining on the small island of Banaba. But, just as the British pulled out, the phosphate deposits ran dry and now times here are difficult. Currently, the biggest export is copra, dried coconut meat, but many I-Kiribati turn to the sea. Some to fish, and others to work as seaman. There is a school here in Tarawa that trains the men as sailors so they can go off on foreign vessels, and send money back to their families. There are few tourists here, and not a lot of activity choices. We elect to spend our day on a tour of Tarawa's WWII relics. In 1942 the Japanese took over the islet of Betio in Tarawa atoll. They began heavily fortifying the islet and building an airstrip. The Japanese had lost most of their aircraft carriers in the battle of Midway, so land-based airfields had become a key element in their bid to hold the Pacific. In 1943, more than a year after the Japanese had begun their fortifications, US Marines arrived to assault Tarawa. It was a terrible, bloody battle with more than a 1,000 dead on each side. The Marines eventually took Tarawa, but the heavy casualties shocked America. Looking down the barrel of an old Japanese eight-inch gun. The battle of Tarawa ended up having little strategic significance in the war, but the Americans learned much from their mistakes. After Tarawa they literally rewrote the book on amphibious assaults, thus saving many lives in further Pacific campaigns as well as in Europe's D-Day. Using Korean slave labor the Japanese had constructed huge concrete bunkers on Betio. The first wave of Marines got ashore relatively unscathed in amtracks, amphibious tracked vehicles, but subsequent waves had to use regular boats. The Americans had misread the tides and their boats hung up on the reef several hundred yards from shore. The Marines had to wade ashore and were cut to ribbons by Japanese machine guns firing from the bunkers under the cover of smoke and dust. The battle lasted three days and ended with the Americans going bunker to bunker burning the defenders out with grenades and flamethrowers. The Japanese, sensing the battle was lost, began last ditch banzai attacks. In the end, only 17 of the elite Japanese troops were captured alive. 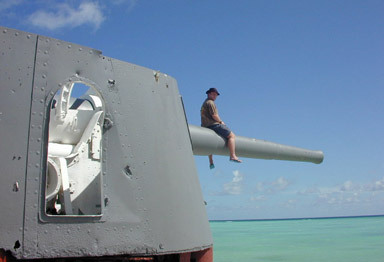 The bunkers still stand today, a legacy to the Japanese determination to hold the atoll. The I-Kiribati have used some of them as foundations for the huts they've built on the land. Likewise, amtrack shells house pigs, and chickens scratch around old machinegun nests. The artifacts, of war now fueling a subsistence life. 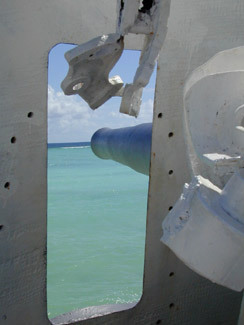 A few of the huge eight-inch gun emplacements survived the assault. They still stand, their barrels pointed out over the magnificent turquoise and blue seas. The gentle waters lap up onto the sand as they always have, oblivious to man's vainglorious attempts to change the way of things. So, just how big is an eight-inch gun? Back at our hotel we called to reconfirm our tickets only to find that Air Marshall Islands is on strike. There will be no flights tomorrow, and in fact it's not at all apparent how I will get from here to Majuro where I have a booked a week of diving on Bikini Atoll. We would have done errands if there were any that could be accomplished here, but instead we just relaxed, got caught up on postcards, and waited to hear from Air Marshall Islands. The word from Air Marshall islands is that maybe they'll be able to fly us to Majuro on Sunday. Stuck here for at least two days we go on a mission to organize some diving. 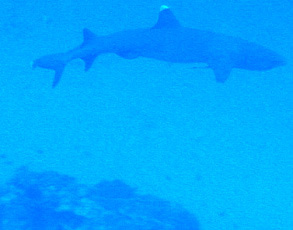 There is one dive resort on the remote, northern tip of Tarawa. It is Japanese owned and fully booked, they show very little interest in trying to accommodate us. Plane B is to borrow some tanks from a commercial fishing outfit that uses them to go for sea cucumber. They are willing to let us have the tanks at a cheap-cheap price, but they have no idea where a recreational diver might want to go. We track down three different boats, but they are all either away or out of commission. Finally we decide to spend the day snorkeling and investigating the possibility of beach entries. It's called a coral atoll for a reason and even though they waves aren't big they are breaking on hard, sharp coral. I manage to snorkel out through the break, but the idea of doing it in scuba gear with Tuk doesn't sound that appealing and the irony of getting one of us hurt on my first post-IE dive is too obvious to ignore. We decide to pass on diving Kiribati. Relax at our hotel. Me writing and Tuk taking pictures of crabs hiding in the lagoon's tide ponds. The Air Marshalls strike is over, and they've come to free us from Tarawa. Tuk wasn't impressed with the tiny 16 seater, but I'm fond of any plane where I get to personally keep an eye on the radar. Bobbing along in the turbulence, listening to the propellers change pitch, you realize just how big a place the Pacific Ocean is. However dinky the plane though, it seems to have flown us all the way to Mid-America, or so it seems. The US has a long and sordid history in this part of the world, but somehow -- I guess naivety -- I didn't expect the influence to be quite so pervasive. From the food on the menu, to the movies in the theatre, it all seems exactly like home. It's surreal though, I look down and sure enough, the road is striped yellow down the center and white on the sides, but if my eyes stray a bit further, I'm reminded that nature has colored this place heaving black ocean to the East and quiet blue lagoon to the West. It's the land of incongruities, vast supermarkets chock full of Budweiser and Cheeze Whiz, but outside the people call yokwe yuk (love to you), while defecating in the streets. The traffic signs are the same, the postage stamps are the same, even the money is the same, except for the fact that while I've been gone, the money has changed, which makes it just that much weirder. Am I going to wake up soon? I promise to read the manual soon. We take advantage of this little pseudo-America and run some errands. Ace Hardware is Ace Hardware, no matter where the front door. Text and photographs are copyright 1994-2003 Evan Bigall, all rights reserved.